As the fall season transitions into winter, gardeners are contemplating what floral beauties will brighten their beds and baskets next year. Colors, textures and styles aren’t just the domain of the fashion world’s catwalks; gardeners, too, are anticipating what’s new for the coming season. The Suntory® Collection of flowering plants recently unveiled new flowers to join its 2014 plant ensemble. Fresh colors, contemporary styles, eye-catching forms—gardeners will find it all among these nine new Suntory® varieties. Click Read More to see what's new for 2014! 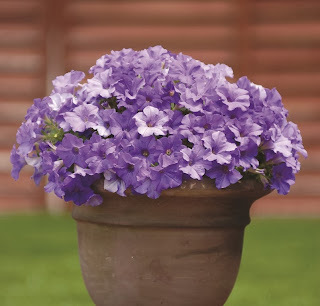 While Surfinias® are nothing new for Suntory®, Surfinia Heavenly Blue adds a color to the collection that is one of the bluest trailing petunias available, giving it a denim-like look. “Heavenly Blue’s tight cascade of flowers are just perfect for hanging baskets, window boxes and mixed patio containers,” Alemanni says, adding that the habit also creates a spilling effect in garden beds and borders. 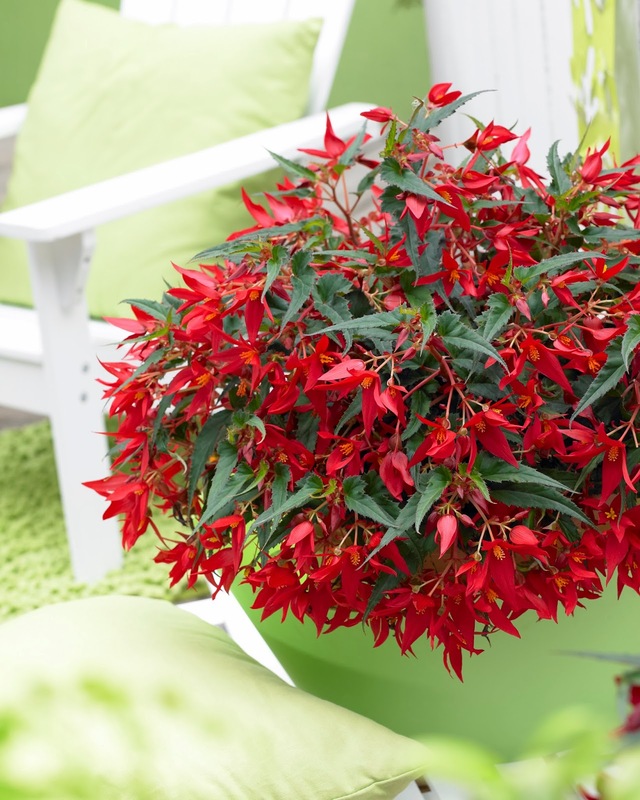 Crackling Fire® Begonia is the funky-punky hairdo of the flower fashion world. It’s all about quick-cut angular shapes and leaf textures with this plant, making it ideal for baskets and containers. Two new colors appear in the Crackling Fire line—Red and Yellow. Combine the two for a mix that’s hot and fiery. Every great fashion collection needs a cape, and two new colors of Lofos® Compact fill the bill. “Don’t let the word ‘compact’ fool you,” says Alemanni. “Lofos Compact Rose and Lofos Compact White are smaller than the first Lofos varieties, but these two plants cascade out of a basket or pot up to two feet long, with tubular flowers blooming all the way down.” Use it as quick cover-up to fill those blank spaces in the garden. Sweet and sassy is one way to describe Temari® Candy Stripe verbena. Verbenas are typically workhorses in the garden—indestructible yet thriving in the hottest conditions. Candy Stripe gives the genre a perky personality with its dark pink- and white-streaked petals. It’s a solid plant that is home in both containers and right in the garden bed. Suntory®’s Sun Parasol® mandevillas made a splash when they first came on the floral fashion scene, bringing with them a tropical sensibility to potted patio plants. Three new Sun Parasols join the collection for 2014. Largest among them is Giant Red Emperor, its 5-in. bright-red flowers shining like rubies among dark-green glossy leaves. Climbing up to 15 feet, Giant Red Emperor is at home and stunning in an elegant urn on the patio or in front of French doors. With slightly smaller flowers, Sun Parasol Pretty Deep Red and Pretty Deep Pink have no less a visual impact than their Giant cousin. Their flowers are somewhat closer together, bejeweling their glossy-green leafy backdrop. 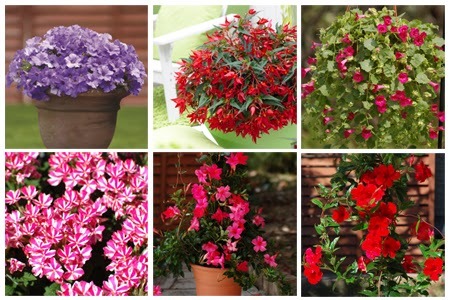 These, too, can be used in urns, baskets and window boxes on the patio or even in the home. These new items from The Suntory® Collection join the line in Spring 2014 and will be available at garden centers and home. I just bought a Red Emperor. I live in Sedona Arizona. Direct sunlight here is very intense and is uncomfortable to stand in during summer. In this climate can I grow the Red Emperor without direct sunlight and still have it bloom? once you take the time to contemplate those desires, you may make sure the success of every plant and eventually your garden overall.All plants want water or some live of wetness.